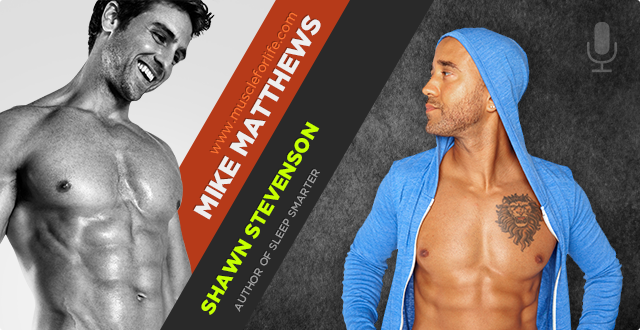 In this podcast I interview Shawn Stevenson, author of the book Sleep Smarter and host of the The Model Health podcast. I wanted to interview Shawn on the subject of sleep because while I’ve written a bit about it, I haven’t really dived into it here on the podcast. “Everyone knows” that getting enough sleep is important, but not everyone knows just how important it really is, and especially for us fitness folk. Sleep insufficiency has been linked to auto crashes, industrial disasters, and medical and other occupational errors. It increases the mortality and the risk of chronic diseases like hypertension, diabetes, depression, obesity, and cancer, and it reduces quality of life and productivity. Research shows that inadequate sleep can even slow weight loss, lead to weight gain and muscle loss, and reduce testosterone levels. The bottom line is that your sleep hygiene is like your diet—it’s either working for you or against you, regardless of whether you realize it. And in this interview, you’re going to learn all about what “good sleep hygiene” really is, and what you can do starting tonight to get some of the best sleep of your life. And, just as a final little teaser, that doesn’t necessarily mean sleeping more than you already are. In fact, you may even be able to sleep less but feel more rested every day by improving the quality or “efficiency” of your sleep. The reality is if your sleep efficiency is really dialed in, you shouldn’t need to spend more than 6 to 6.5 hours in bed every night, and in this interview, Shawn explains why and how to get there. 5:58 – How many hours of sleep do you need per night? How does sleep affect your body’s ability to recover? 14:48 – How do you know if you’re sleep deprived? 15:58 – Can you make up for lost sleep with taking a nap? 17:42 – What are some strategies for getting good sleep? 22:18 – What is cortisol and melatonin, and how does it affect our sleep? 26:53 – How does light from our cell phones and tv’s change our sleep patterns? 31:17 – Does caffeine and pre-workout affect your sleep? 35:30 – How can we change our bedroom environment to allow better sleep? 43:34 – What’s the best room temperature to sleep in? 49:35 – What are the benefits of getting proper sleep? 55:41 – Does eating a meal near your bed time affect your sleep? 58:00 – How can people connect with you and find your work? 8:50 – How many hours of sleep do you need per night? How does sleep affect your body’s ability to recover? 17:40 – How do you know if you’re sleep deprived? 18:50 – Can you make up for lost sleep with taking a nap? 20:34 – What are some strategies for getting good sleep? 25:10 – What is cortisol and melatonin, and how does it affect our sleep? 29:45 – How does light from our cell phones and tv’s change our sleep patterns? 34:09 – Does caffeine and pre-workout affect your sleep? 38:22 – How can we change our bedroom environment to allow better sleep? 46:26 – What’s the best room temperature to sleep in? 52:27 – What are the benefits of getting proper sleep? 58:33 – Does eating a meal near your bed time affect your sleep? 1:00:52 – How can people connect with you and find your work?